Copyright information: Data used to produce the image above was provided by NASA's Earth Science Enterprise Scientific Data Purchase Program and produced, under NASA contract, by Earth Satellite Corporation. Thank you to those agencies for use of the data. 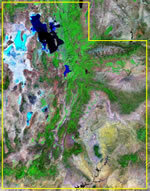 The Landsat image was composed by Angela King and is property of Geology.com. Use of any Geology.com image without written permission is prohibited.